Let me ask you this. If Satan himself was to manifest before your eyes or even move about you in a permissive manner in your life, how do you suppose he would go about doing that? He would appear as an angel of light, right? Of course, that's exactly what Paul stated in 2 Corinthians 11:14 when he said, "And no marvel; for Satan himself is transformed into an angel of light." And so Satan would never come to you in his true form dripping with rotted flesh with millions of flies following after him in the hopes of a quick meal. No, he will come to you as your best friend, a gentle stranger, a so called Christian and as we see here a Pope. Now yes, the title Pope is a Pagan title wherein it depicts he is a devil worshiper. In fact, his office was outed years ago holding Satan worship services inside Vatican walls and this particular Pope is worse than most in that he is trained in the bloodthirsty deceptive art of Ignatius Loyola. For those unaware, Ignatius Loyola founded the blood curdling Jesuit order. 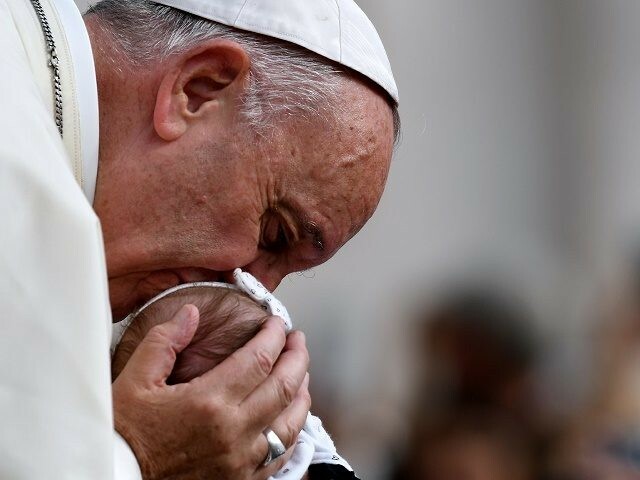 And so, when this Pope asks for prayers to save the babies the people of the world need to take off the rose colored glasses and see him for who he really is. He's not only a Jesuit who took the most evil oath ever taken by man, he is the man of sin and a bold faced liar. Besides all the other insane statements he has made in the last few years about Jesus failing on the cross (TWICE!) to card carrying Atheists gaining Heaven, he is now acting as if abortion is more than he sees it as per the written Word of God. What I mean is, abortion to the Popes of Rome is nothing more than a political foot in the door. They kill just as many babies in Catholic hospitals than any other hospitals and clinics do. In fact, the one Pope he recently canonized as a Saint, that being the infamous Karol Wojtyla (aka Pope John Paul II) who sold the poison gas to the Nazis to kill Christians, Jews and blacks, stated in his prophesied and confirmed bogus apology that his church hierarchy was sorry for all the millions of babies they killed, that are still being found to this day buried under Catholic Convents. Something else most fail to realize about this and the last few popes is, they will lie about some in their number who claim to be devout Catholics who have stated in writing that they no longer believed in God so as to keep their ministries pumping in the cash to the Vatican. That's right, he literally quoted Mother Teresa in this speech as if she is someone to emulate but she openly denied God before all and even allowed herself bowing in worship before Buddha no less! See proof here. When the man of sin speaks, his speech will be filtered with the lies of his dying god Beelzebub. Nothing more, nothing less. And we have God's truth filled Word to back that up cover to cover!